Looking to reduce your utility bills? Energy-efficient landscaping can make your home more comfortable while conserving vital natural resources. Landscape water use accounts for about 30 percent of residential water use. Further, the Environmental Protection Agency (EPA) estimates that about 50 percent of outdoor water is wasted due to over-watering, runoff and evaporation. Besides making your property more attractive, cultivating the right trees, grass and plants is good for both your wallet and the planet. Landscaping to provide shade is the most cost-effective way to lower the cost of air conditioning your home. Adding energy-efficient landscaping to a non-shaded yard can create significant savings — from 15 to a full 50 percent. Compared to non-shaded areas, the summer daytime air temperature can be up to 6 degrees cooler in tree-shaded neighborhoods. But what trees should you plant? Consider your shade needs. Deciduous trees drop their leaves in the fall and go dormant in the winter. As such, deciduous trees, like oak, maple and hickory, block solar energy primarily through the spring and summer months. Evergreen trees never drop their leaves and provide shade year-round. If you live in a warmer and/or more arid part of the country, evergreen trees may be more desirable than their deciduous counterparts. Trees of sufficient height and age can provide enough shade to lower the temperature of your walls and roof by up to 20 degrees. To shade your exterior walls and windows, the trees you plant should be between 6 and 8 feet tall. If cared for, these trees should be shading your roof within five to 10 years. Plant shade trees to the south and southwest of your home. Doing so will screen your house from 70 to 90 percent of the summer sun. Trees with crowns lower to the ground are ideal from shading the west side of your home from the lower afternoon sun. Finally, if you need even more shade, consider a trellis or arbor planted with shrubs and vines. Planting shrubs and ground-cover plants around your home’s foundation also cools the air around the base of your home. Xeriscaping — landscaping with plants that use less water — can reduce your outdoor water use by up to 50 percent. You can minimize the amount of yard and lawn real estate taken up by thirsty grass by considering alternatives such as planting beds, wildflowers and mulch beds of bark. Adding a deck, patio and/or an assortment of stone or gravel walking paths are all great xeriscaping solutions for your backyard. If you just can’t give up on turf, re-sod with drought-resistant grasses such as Buffalo or Bermuda. Be sure to aerate your soil to improve the flow of water to your plants’ root systems, promote absorption and prevent excessive run-off. Group plants with similar water needs together. Practically any plant can be part of a xeriscape landscape if it’s grouped accordingly. Finally, remember that the best plants for xeriscaping vary by region, so check with your local nursery or cooperative extension for expert advice. Altering the landscape itself is just one component of making your lawn and yard more energy-efficient. Homeowners must also begin maintaining and caring for their landscaping differently as well. Water wisely, and water deeply — that is, water only when your plants need it. During the growing season, most grass needs only about 1 inch of water per week. Water in the morning or evening when temperatures are cooler and water is less likely to evaporate. Consider replacing your sprinklers with soaker hoses that deliver water directly to your plant’s root systems. 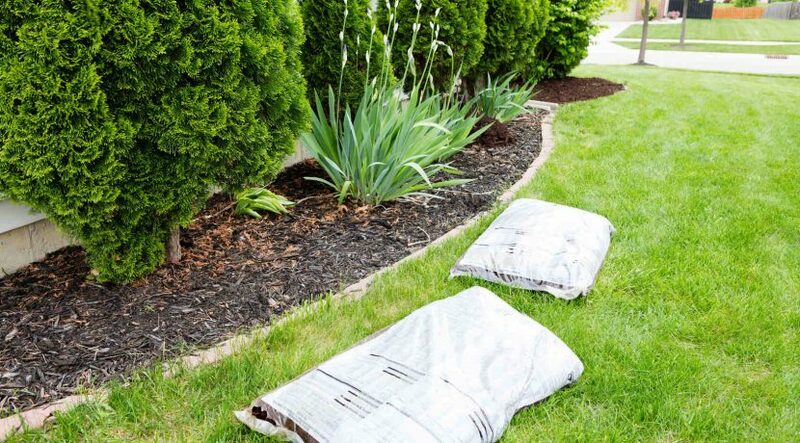 Mulch around the bases of your trees and shrubs to promote moisture retention. Finally, taper off watering in the fall and resume as needed in the spring. Mow higher and more often. Raise your mower’s cutting blade and avoid scalping your lawn. Taller grass blades shade each other and hold more water. Grass cut too short dries out quickly. To promote healthy growth, mow your grass once a week during the growing season. Put down mulch. 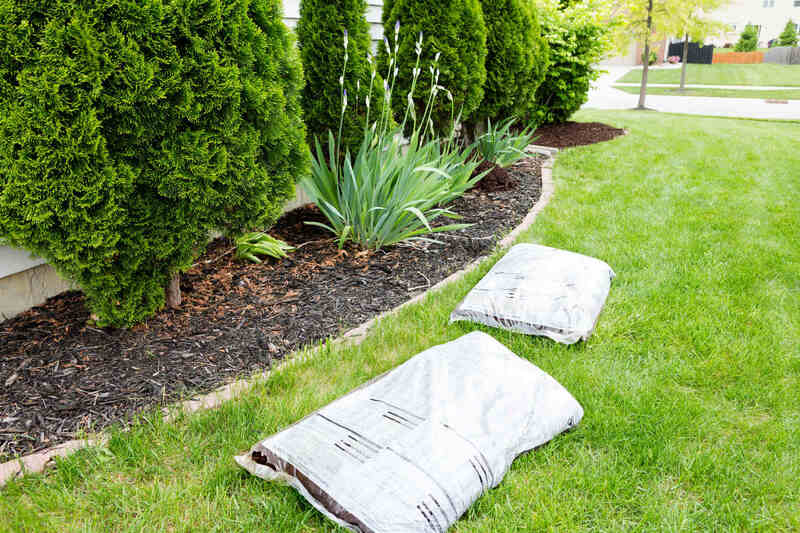 Mulch in planting beds and around the base of trees will help limit evaporation, reduce soil erosion and prevent weeds — most of which are water hogs — from establishing themselves. Mulch materials include shredded bark, wood chips, pine needles, straw, composted leaves and recycled rubber. The proper depth of the mulch you spread depends on the type you choose. The coarser the material, the deeper it needs to be. Going green isn’t all that hard, and it can have surprising benefits. By putting a little thought and planning into your landscaping, you can make your home more energy-efficient. What will you do with your extra savings?